Tonight, Clemson and Alabama will meet in college football’s championship game in Glendale, Arizona. Ranked No. 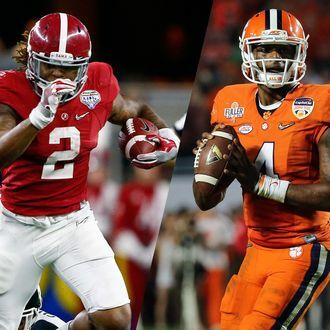 1 and 2 in the country, respectively, the 14–0 Tigers and 13–1 Crimson Tide both advanced with comfortable semifinal wins on New Year’s Eve, setting the stage for the title game in the College Football Playoff, instituted last season to replace the BCS. Here, five things to know about the game. 1. Undefeated Clemson is the underdog. Despite one loss on the season, Alabama and its excellent defense are favored to win against undefeated Clemson. Being favored is nothing new for the SEC powerhouse Crimson Tide: They’ve been an underdog just once in 81 games under head coach Nick Saban, including three BCS championship games — all of which they won. Clemson, meanwhile, wasn’t even favored to win its semifinal game against Oklahoma, but came away with a 37–17 victory. 2. Clemson has done some trash-talking. 3. Clemson head coach Dabo Swinney prayed with Ben Carson last night. The Republican presidential candidate’s South Carolina staff learned that Swinney was a “fan” of Carson’s, according to Fox News, and set up the call. The two men prayed for the team “to do very well,” though Carson’s campaign said he isn’t taking sides. That said, the campaign added that Carson was happy to pray for Clemson because he believes in underdogs. 4. There are a lot of ways to watch the game. ESPN is offering 14 different ways to follow tonight’s broadcast, including standard play-by-play on the main ESPN network, a broadcast with partisan announcers for each school on ESPNU, a feed with just the sound from inside the stadium on ESPN Classic, and one channel online that will show images from the eight end-zone pylons for the entire game. 5. Tickets aren’t as hot as you’d think. Via CBS Sports, tickets on the secondary market are the cheapest they’ve been for a college football title game in recent years. The average price on StubHub was $675 in the hours leading up to the game, with seats available for as little as $190. (The face value for tickets ranged from $450 to $650.) But last year, tickets averaged just over $800 on StubHub; in 2013, the average price was over $1,600. One possible reason: expensive airfare for fans from South Carolina or Alabama to Phoenix.